Today is St. Patrick's Day, when everyone pretends to be Irish. Across the US, Irish-wannabees celebrate by wearing green, eating corned beef, drinking Guinness, and kicking up their heels. While St Patrick's Day is a celebration of Ireland, Patrick wasn't Irish. As a boy, he was kidnapped from Britain and taken to Ireland as a slave. After escaping back home, he chose to return to Ireland as a missionary. He evangelized the island for Christianity and became the patron saint of Ireland. It didn't make much sense, but even Patrick couldn't stay away from Ireland. The Irish themselves don't wear green on St Patrick's day. They don't eat corned beef and cabbage, either. But the Irish are definitely known for drinking Guinness and dancing the jig, and that is not confined to St Patrick's Day. Our younger daughter is an Irish dancer. Although our Irish blood has become thin over the years, Ireland has my heart and I was thrilled when MM developed a passion for dancing the reel and jig. The first time she saw Irish dancing, she looked at me with passion flaring in her eyes and said, "Mom, I HAVE to do this!" That was four years ago. At 8, she was late to the game. Most kids start when they're 3 or 4. But age should never keep you from doing what you love. Especially when you have red hair and an Irish-sounding name like Mary-Margaret. 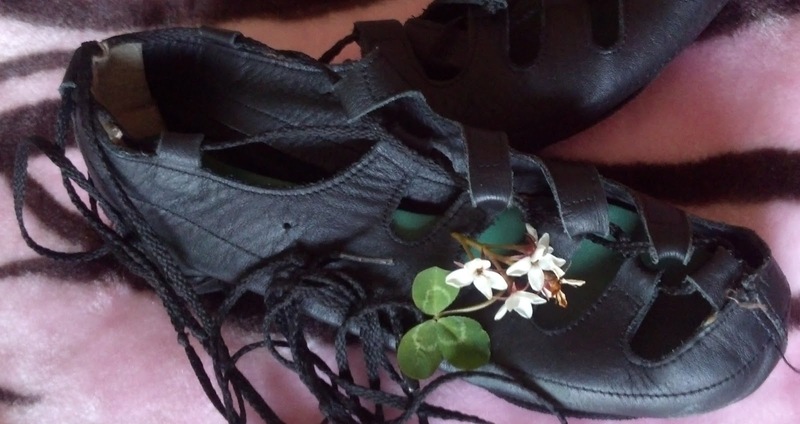 Irish dance gets a lot of publicity at St. Patrick's Day, but it is a year-round sport. It takes an amazing amount of athleticism, grace and endurance to compete in Irish dance. We spend many weekends throughout the year taking our daughter to competitions known as feis (“feysh”) in our region and through the US. School breaks are spent at Irish dance camps honing skills and preparing for the Oireachtas (“o-rock-tas” or regional competition). Irish dance is intensive work. But it is also fun, beautiful, and very rewarding. In three years of following our daughter around for parades and competitions and performances, I have picked up a few things that I think are helpful in general life. As much as I disliked it at first, to be competitive in Irish dance you have to look good. It’s not exactly Toddler’s and Tiaras, but it does mean buying the curly wigs, makeup, spray tans, expensive dresses, expensive shoes…..
Ok, it sounds similar, but truth is, if you want to win, you have to look good. Success in dance and in life often requires having the best tools and training you can afford, even if you have to sacrifice something else. On the other hand, Bobbi Brown could personally do your feis makeup and you could wear a $5000 dress hand embroidered by blind Irish nuns - if you don’t dance well and dance hard, you and your priceless dress will go home disappointed. Even though looking good is important, very few people can successfully coast through life on looks alone. Everyone needs to learn to do something well, to take pride in a job well done, to contribute to the greater good. One day my daughter used the phrase “cute don’t last, you better learn how to dance.” I laughed and asked her where she learned that. She explained her Irish dance teacher told them that all the time - people might be impressed by cuteness when you’re young, but you’d better work hard and learn the steps because one day “cute” would be gone. Yep, ‘nuff said. Irish dancers wear a bubbly white sock known as a poodle sock. At my daughter's first competition, she lost points when her poodle socks fell. Then I learned about something called sock glue. It is literally a glue you roll on a dancer's legs to keep socks (and points) in place. At her second competition, my daughter's socks stayed put all day. I don’t know why they don’t sell this stuff in department stores! Have a wayward bra strap? Roll on a little sock glue and that strap will stray no more. Stretchy boots losing their grip? Use some sock glue. Need to stop your blouse from flashing unsuspecting co-workers? Sock glue, baby! We now have two bottles - one in my daughter's dance bag and one in my dressing table. Seriously, if I can figure out how to market sock glue to Macy’s, I will retire early. Irish dance isn't just about what you do on stage. It's about all the preparation you do beforehand, about all of the performances and classes and stretching. It's as much about conditioning the mind as conditioning the body. At competitions, a dancer has to have her game face on from before she lines up to go on stage until after she is out of the sight of the judges. This requires discipline and self assurance that goes back months or years before a dancer gets on stage. It means you look, act, and feel like a winner when you’re standing in line-up, when you and another dancer collide, when you slip and fall on stage, when the music is disrupted, when someone in the audience is talking, and when you just don’t feel like dancing. You don’t give up on yourself before you start, while you’re dancing, or after the scores come out. Good advice for work, marriage, family, etc. Irish dance is competitive and the dancers work very hard to get to the top. At competitions there are multiple dancers on a stage at a time. Because they all have different choreography, it is difficult to know where one dancer is going to high kick and another is going to leap. They do their best to keep their steps and maneuver around each other. Even then, collisions and mishaps are part of the game. Usually they are accidental. Sometimes, unfortunately, they are not. The quickest way to get banned from competition is to sabotage a competitor. Just remember “cute don’t last…” and don’t do it. Ever. We have very little Irish heritage. Yet our daughter loves Irish dance and we are totally committed to her success. We've become a part of this Irish dance family and love it. And we have found out we aren't alone in celebrating a heritage that isn't ours. We have met dancers and families from all walks of life and cultures – African, Asian, Latino, Dutch, etc. And not one of us has had to take an Irish DNA test to see if we qualified to be a part of this family. We just accept each other where we are. Whether we are Irish or not, we celebrate the dance. And to that we say "Rince Gaelach go Brach" - Irish Dance Forever!